Being a contrarian is often a difficult assignment. That’s because everyone wants to go along with the crowd, especially if the crowd has been struck with an acute case of bull fever. There’s been a big outbreak of just such an ailment so far this year, and that bull fever continues to heat up nearly every segment of the equity markets. The gains we’ve seen in 2012 have indeed been impressive, and I’m not going to deny that the smart money is back to betting big on stocks. 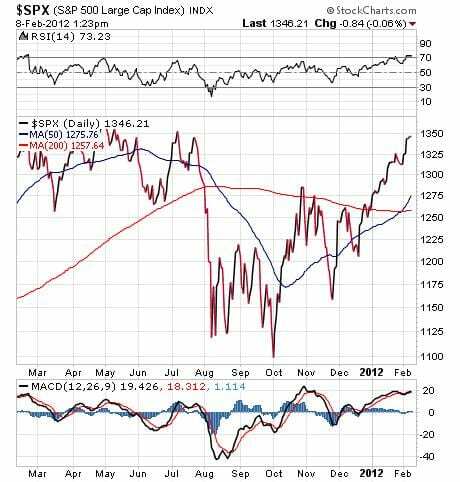 However, the move higher this year doesn’t change my opinion that the markets are headed for a serious pullback. On the contrary, the sharp rise of nearly 6% year to date in broad market indices such as the S&P 500 Index has me even more convinced that this market is primed to roll over. Why am I still donning this contrarian robe? Well, I can assure you it’s not for the sake of being different. If I truly thought stocks were able to sustain their current uptrend, I would be “all in” within the various portfolios of my investment advisory newsletters, and with my money management clients. The way I see it, the negatives out there easily outweigh the positives, and I think the market is starting to realize that the gains through the first five weeks of the year are ultimately unsustainable. Now admittedly, from a technical perspective, the market does look bullish, as stocks now trade well above both their 50- and 200-day moving averages. Fundamentally, however, there are big problems beginning to rear their ugly heads. Think about why stocks are moving higher right now? The answer is an improving U.S. economy, and the hope that Europe’s issues will be worked out. Here’s where I think both of these near-clear catalysts break down upon further scrutiny. The problem with the first reason is that the U.S. economy is by no means seeing signs of strong growth. Rather, we are merely seeing metrics such as gross domestic product (GDP) growth and employment data besting already deeply depressed expectations. Given this context, I can’t get very bullish on a convalescent U.S. economy. This caution is particularly valid, given the potential downside from a misperception of the second reason the market has rallied, Europe. The problem with the belief that Europe will be able to successfully cope with its looming fiscal issues really suffers from a gross underestimation of just how bad things are in countries such as Greece, Ireland, Italy, Portugal and Spain. I think traders are overestimating how quickly and efficiently any European Union or European Central Bank policy response can be. As a result, the bulls could be setting themselves up for a big disappointment. Until the bad taste of these issues is cleared from the market’s palate, I will remain a contrarian — and I will continue approaching this market with the utmost caution. For the past five weeks, we’ve outlined the personal finance exercises I want you to undertake for 2012. This week, we have the sixth and final installment in our series. To wrap things up, I want you to conduct an overview of two of the most important elements in your overall financial picture — insurance and annuities. Insurance can take many forms, and the need for insurance is a very personal one. The most common reason to have a good life insurance policy in place is to replace lost income due to the death of a spouse, and to provide survivors with the financial stability necessary to not worry about fiscal issues. For high-net-worth individuals, life insurance can be used to defer capital for retirement, and to help protect and grow that wealth for their dependents. As for annuities, they also can be very good financial instruments — if they fit your overall financial goals. 1) What policies do I have, and what’s the benefit amount in each policy? 2) Where are my policies, and am I dealing with more than two companies? If so, you may want to consolidate these. 3) Do I have sufficient insurance to take care of my dependents? Many people bought policies when they first were married. Now, you may have children, you may be making a lot more money than you used to, and you may have significant assets such as a home to protect. 4) What kind of premiums are you paying for your policies, and how much are you paying in annuity fees? The latter can be substantial, so if you are paying substantial annuity fees, it’s time to see if those fees can be reduced. Performing an insurance and annuity review will give you a good idea of what you have and where you stand. It also allows you to address any flaws in your overall financial plan. At my investment advisory firm, Fabian Wealth Strategies, we’ve set up a webpage to help you address some of the common questions involved when assessing your life insurance picture. I invite you to pay a visit to this page before you conduct your own insurance review. If you’d like to hear more about this opportunity, as well as other personal finance exercises, and if you’d like my take on all of the market action, then sign up here for my weekly audio podcast. After the precipitous fall of the emerging markets during the second half of last year, many exchange-traded funds (ETFs) devoted to those countries are coming back twice as fast. India, in particular, is one of the best-performing stock markets in the world so far this year. Year-to-date, India’s stock market has returned nearly 14%. What also has helped boost prices in India has been an appreciating Indian rupee. The rise of the rupee specifically has fueled the returns of Indian ETFs. For example, WisdomTree India Earnings Fund (EPI) is one of the top-performing ETFs year-to-date with nearly a 30.7% return. The fund seeks investment results that correspond to the price and yield performance, before fees and expenses, of the WisdomTree India Earnings Index. EPI is the first ETF I have found that invests exclusively in India, one of the world’s fastest-growing economies. Within this ETF, the financial services sector makes up nearly 25.99% of its holdings. Banking continues to be one of the top growth sectors in India, since many of the people there still do not use banks. As India’s economy continues to expand and its middle class grows, more people will be using banks for the first time. As a result, banking has been a boom sector of late and there still is room to grow. It is clear that India, the home of the most Bengal tigers of any country in the world, is showing strength so far in 2012 that is worthy of the big cat. As investors from around the world are watching returns from the developed economies diminish, they are looking toward developing markets such as India. The Indian market can be extremely volatile, though, since it depends heavily on foreign investor interest. So, weigh your potential risks before investing. The large run up in equities to start 2012 is a good reason to consider waiting for a pullback before adding ETFs like EPI to your portfolio. It is 2012, and that means it’s a great time to make sure you have the right strategies in place for your growth assets, as well as the right strategies in place for your income-generating investments. In what likely will be a very challenging year for the markets, having the right strategies in place both to preserve and to grow your capital is absolutely critical to your investment success. Now is the perfect time to decide how you should position your investment dollars to achieve your financial goals in 2012. Make no mistake; the year ahead will be very tricky. The markets will continue to be plagued by Europe’s debt problems, as well as a global economic slowdown led by China. Then we have the rollover of enormous debt loads in Japan, Europe and the United States, all of which could wreak havoc on your wealth in the coming year — if you’re unprepared. We think that how you position your assets at the beginning of the year will be a big determining factor on whether you succeed, or whether you fail, in achieving your investing goals in 2012. To help ensure you are on the right track for the year, Fabian Wealth Strategies has put together an audio special report titled, The Right Strategies for 2012. Which ETFs offer you the opportunity for steady and secure income. Which stock market regions are poised to show the strongest growth in 2012. Which sectors we believe you should be allocating to for strong returns. What the fallout from Europe’s debt crisis will be on U.S. investors. What we think will be the opportunity of the year for prepared investors. This audio special report is FREE, and all you have to do to listen is click here. Here’s to a fantastic year for the well-prepared investor! Perhaps the greatest folk musician of all time, Bob Dylan knew how to put things in a way that touches the heart. Recent events in my own life have prompted me to take care of the memories that really matter. I know I cannot relive them, but I certainly can put them on the pedestal where they rightfully belong. I hope you’ll do the same with your memories. The major U.S. stock indexes closed another week of gains with the Dow Jones rising 1.94% and the S&P 500 Index up 2.64%. 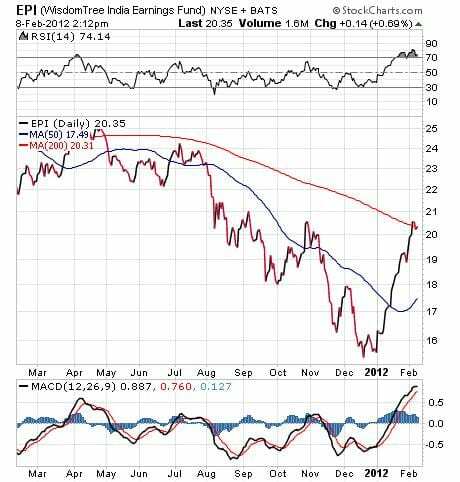 The MSCI Emerging Markets Index ended the week 3.69% higher.